Goggles are great for snowy days but you’ll need a pair of sunglasses for sunny days. Don’t be the goof and be the only person wearing ski goggles on a hot day. Here’s another thing to thing about: snow can reflect 85 to 90 percent of the sun’s UV rays. Your eyes are under major assault from the sun’s harmful rays while you’re out on the slopes. This is partially because of the angle of the sun. The sun’s rays are also stronger due to the reduced amount of atmosphere as well as the intense reflection off the contrasting stark white snow. Don’t let your peepers get burned! Get yourself a pair of the best snow sunglasses and cruise the mountain in style. One word of caution: don’t buy a super expensive pair of sunglasses and bang them up your first trip to the mountain. Unless you’re super pro and hardly ever fall, it’s a good idea to get a cheap or middle priced pair and not go rocking the $300 Ray Bans. Certainly, look for impact resistant sunglasses such as the ones in our list below. In this section, we have reviews of all of the best snow sunglasses for you to browse. We’ve tried to highlight as many of the great features and benefits as we can to make your shopping experience easier. These sunglasses are windproof, anti-dust, rainproof, and 100% UV protection. The sunglasses are lightweight, and available in a variety of lens tints to best fit the environment. The lenses are made from polycarbonate and are shatterproof. Add in a secure strap, and you’ll have the security of goggles but the low profile of sunglasses. These virtually unbreakable sunglasses are made from high-quality polycarbonate. The lenses are super thin, light, and impact resistant plastic carbonate. The lenses are level UV 400 with 100% UV protection. They have also been treated for anti-fog. An adjust strap is included so you won’t lose them out on the slopes. They also have padding on the forehead to increase protection from the wind and elements. If you are looking to block out all light possible these are the best sunglasses for snow sports for you. They have UV protection of 400 with black lenses. The lenses are anti-fog with a no distortion so as to not affect your vision. The wrap around style protects your peripheral vision. You have a 90-day money back guarantee. So feel free to buy a pair and try them out. They also come with a lifetime breakage guarantee. This will come in handy as you will be wearing them out on the slopes. The Hot Sports are lightweight and impact resistant. The UV level of protection is 400, making them the most protective possible. The lenses are yellow, perfect for snowy or low visibility days. The lenses are PC and the frame is plastic. These unbreakable composite frames and lenses come in a wide variety of frame and lens color combinations. This gives you the freedom to get them in the color you need for your next adventure. The composite material makes these sunglasses super lightweight. The frame design is ergonomic, making it possible for you to forget that you’re wearing them. The lenses are HD 9 layer polarized to prevent glare. The UV protection level is 400 on all color options. In addition to the sunglasses, you will also get a cleaning cloth, pouch, polarized test card, glasses screwdriver, and strap. These sunglasses are the best snow sunglasses for protecting children’s eyes out on the slopes. If you are looking for style and sun protection, then the NIEEPA sunglasses are what you’ve been looking for. The square frame and colored lenses are on point for modern style. The different colored lens options also give you the ability to buy the color that fits your visibility needs out on the slopes All of the lenses come with the black frame. The lenses are anti-reflective and polarized for ultimate glare protection. They have a UV protection of 400. The best snow sunglasses aren’t enough and you’d rather have goggles, check out the best goggles of 2018. A lens combination of true colors in bright light conditions and high-glare reduction make these ideal to read the terrain and navigate your way safely down the mountain. These come loaded with UA Grilamid, titanium, three-point nosepad, and shock absorbing cushion hinges. That’s right, they are ready to take on whatever Mother Nature throws at them. The Igniter performance sunglasses blocks out 100% of UVA, UVB and UVC rays. The lens coating helps repel water and is resistant to smudges and scratches — ideal for the harsh conditions found on the slopes. These sunglasses are available in black/white frames and a variety of lens styles. The Dagr Polarized Sunglasses from Ergodyne are ideal for outdoor use. Whether its water, snow, or any other high glare environment, the polarized lens will block nearly all harmful UV rays. These sunglasses meet ANSI safety and military ballistic impact protection requirements. What’s that mean? That they are darn tough and impact resistant. The rubber temple and nose pieces help keep the glasses from slipping. Got a little hipster in you? Looking for something different? Julbo’as Glacier Sunglasses may be just the thing. Not only do they block out all those unfriendly UV rays they also feature leather side shields and nose piece to keep bits of snow from agitating your vision. The round lens and leather pieces may result in some unsolicited compliments on the mountain and aren’t for folks who like to keep a low profile. The Oakley Holbrook Iridium Sport Sunglasses are perfect for snow activities like snowshoeing, cross country skiing, and alpine hiking. These are more expensive then we typically suggest for downhill skiiers since it is easy to go through a few pairs of sunglasses in the course of a snow season. Nevertheless, if you’re looking for something to take it easy on the slopes and in the lodge (or very confident in your ability not to fall) these are an excellent premium option with plenty of lens styles available. Their lightweight and strong frame structure are ideal for most active sports. 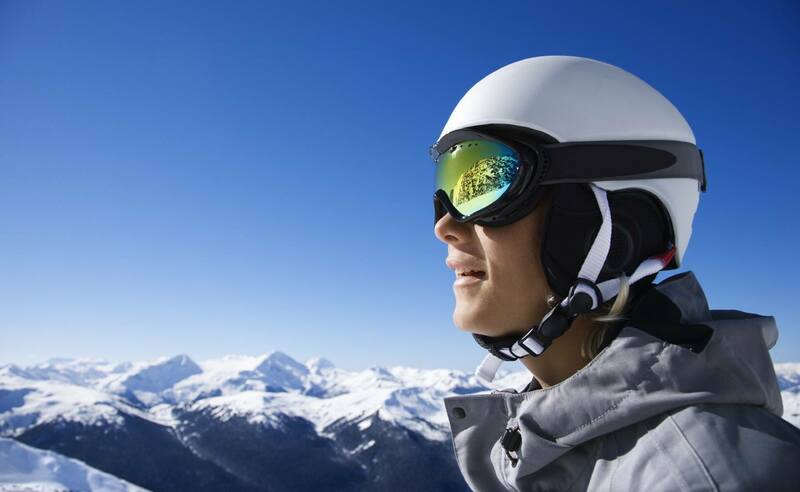 You’ll need both sunglasses and goggles if you are serious about getting out on the slopes. Which one you wear will depend on the weather conditions of the day. Sunglasses work great on sunny days where the weather is good. Goggles are better suited days where the weather is cloudy, foggy, or snowy. You may also find goggles work better with your ski helmet. It is probably a good idea to pack both for your next ski trip. Weather conditions can change rapidly at high altitudes. The main purpose of sunglasses having a UV filter is to protect your eyes from the sun’s harmful rays. This is the same protection that sunscreen gives your skin. For every thousand feet above sea level you go, the UV radiation you are exposed to increases by 5%. So this means that if you are 5,000 feet above sea level you are experiencing 20% more of the sun’s harmful radiation. You’ll want to find sunglasses with a minimum protective filter rating of at least three. If you are buying sunglasses for kids a filter rating of two is suitable as the darker filter may hinder their vision. For the most amount of protection look for sunglasses with 100% protection from UVA, UVB, and UVC rays. This will cut out the most amount of harmful rays from the sun and snow. By choosing lenses that have been polarized you will cut out a majority of the glare that is created from the sun’s light rays reflecting off the sun. They will also increase the contrast. By wearing these during the brightest times of the day you will reduce eye strain and impairment. Avoid wearing polarized lenses at night or low light as things will look darker than they really are. The darker the lens color the more protection you will have from the brightest sunlight. These colors are a dark grey, dark brown, and mirrored. If you are out on the slopes when there is low visibility look for a lighter color such as pink, yellow, or green. Amber is the ideal color to enhance your vision to see bumps and change in surfaces. For those who wear contacts, sunglasses may not provide enough protection from wind and snow. If you wear glasses you may prefer goggles that can go over your glasses. Fogging is bound to happen to your sunglasses as your warm breath hits your sunglasses. Look for lenses that are treated for anti-fogging.